Carrstone Cottage01263 715779work01603 870304fax Self-cateringHeacham is a bustling little village situated on the North West coast of Norfolk. With its wide sandy beach, close proximity to Sandringham, the coastal resort of Hunstanton, as well as Norfolk Lavender - world famous for its superb range of lavender plants and products - and lying midway between Snettisham and Titchwell RSPB reserves, it is an ideal location for an enjoyable holiday. The village is well served with shops and is close to many of the pubs and restaurants that this area of Norfolk is renowned for. A well equipped cosy cottage that has been updated with refreshing contemporary furniture and furnishings. 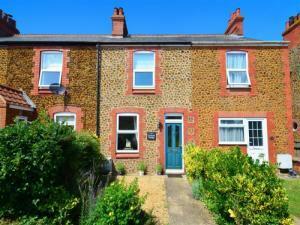 A lovely enclosed garden to the rear, and very conveniently located for all North Norfolk's many attractions. Exterior image of this handsome carrstone house. Heacham is a bustling little village situated on the North West coast of Norfolk. With its wide sandy beach, close proximity to Sandringham, the coastal resort of Hunstanton, as well as Norfolk Lavender - world famous for its superb range of lavender plants and products - and lying midway between Snettisham and Titchwell RSPB reserves, it is an ideal location for an enjoyable holiday. The village is well served with shops and is close to many of the pubs and restaurants that this area of Norfolk is renowned for.